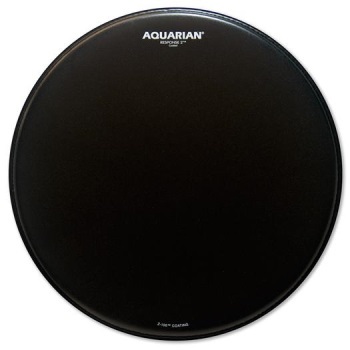 The Response 2 Texture Coated is a two-ply drumhead featuring the durable black finish texture coating. The Safe-T-Loc Hoop prevents slippage inside the hoop so that the head does not de-tune during a performance and will not pull out. An exclusive Sound Curve Collar Design allows the drumhead to seat perfectly on the bearing edge. These heads conform instantly to any shell design. Extra-Warm Drumhead Film produces a rich, warm and full mid range sound on toms and more low end on bass drums. It eliminates the "ping" and "plastic" sound common to other drumheads. The Black Finish Texture Coating is extremely thin, and it provides a more responsive surface for brushes and sticks. It does not chip off and it outlasts all others.